Earlier this month, The Upkeep Shoppe opened its doors on Preston Street. Intrigued by the slick branding, unisex marketing campaign, and unique blend of spa services and tea products, SHOP TALK paid a visit. 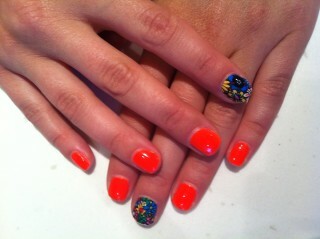 Sarah Fischer tested out the Minx nails at new Preston salon The Upkeep Shoppe. Photo by Melissa Peters. ST was further intrigued by the Minx nails on offer. While we’re not exactly what you’d call spa regulars — our idea of a manicure is a porch session with a bottle of nail polish and a few beers — we couldn’t help but notice Minx. With their snazzy designs, bright colours, and perfect shine, they are like that polished gal who works down the hall: Every time she walks by, you can’t help but turn and admire. Sarah Fischer tried one on each hand; full manicure with Minx will cost you $50 at The Upkeep Shoppe. Following this little investigation, we suddenly started to notice other outlandish nail trends. For example, drug store standby Sally Hansen is now offering patterned nail strips, touted to last up to 10 days. In other nail news, M.A.C. 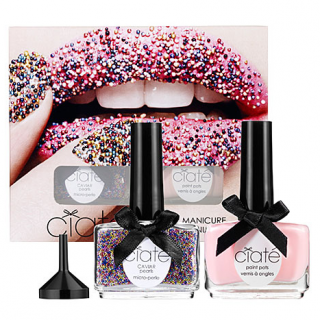 is clearly into the nail trends: the make-up leader recently announced a major overhaul of its nail polish offerings. By year’s end, there will be 65 permanent colours in its collection — a huge step up from its previous eight shades.